Chase Twichell's poetry is marked by a strong identification with the natural world, one that exceeds any with other human beings. There's a dissociation born of a rough childhood, which only the later poems address head-on, though many earlier ones circle around it. Central early concerns are the heartbreak of love between men and women, the ecological decimation of our planet, and the nature of the human mind. 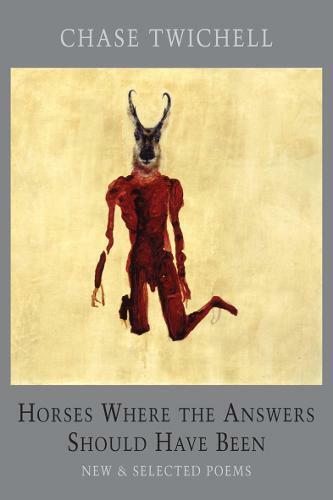 Horses Where the Answers Should Have Been shows the evolution of a distinctive voice in American poetry through several collections written over 35 years. Beginning with "Perdido" (1991), each of her collections has had a distinct centre of gravity, with each poem contributing to a whole larger than the sum of its parts. Perdido probes the relationship between love and death. "The Ghost of Eden" (1995) grieves and rails against our poor stewardship of the earth. "The Snow Watcher" (1998) chronicles the early years of her study of Zen Buddhism - a crucial influence on all her later work - and begins to address a central fact of her childhood: early sexual abuse at the hands of a "family friend", and a lifelong battle with depression. "Dog Language" (2005) continues to explore these themes, and also the dementia and death of her father from alcoholism. In the background, questions regarding the human self continue to arise. The new poems of "Horses Where the Answers Should Have Been" are much more frontal in their treatment of these evolving, interlocked concerns, forthrightly taking on childhood sexual trauma, mental illness and substance abuse. But the heart of the book is the poems' focus on Twichell's continuing, deepening enquiry into the nature of the self as seen through the eyes of Zen. What is most interesting (and problematic) about these poems is that just as poetry goes where prose cannot, so Zen goes where language cannot. Thus the poems become sparer and sparer as they approach saying what cannot be said.